AR-15 in .308? But not an AR-10? 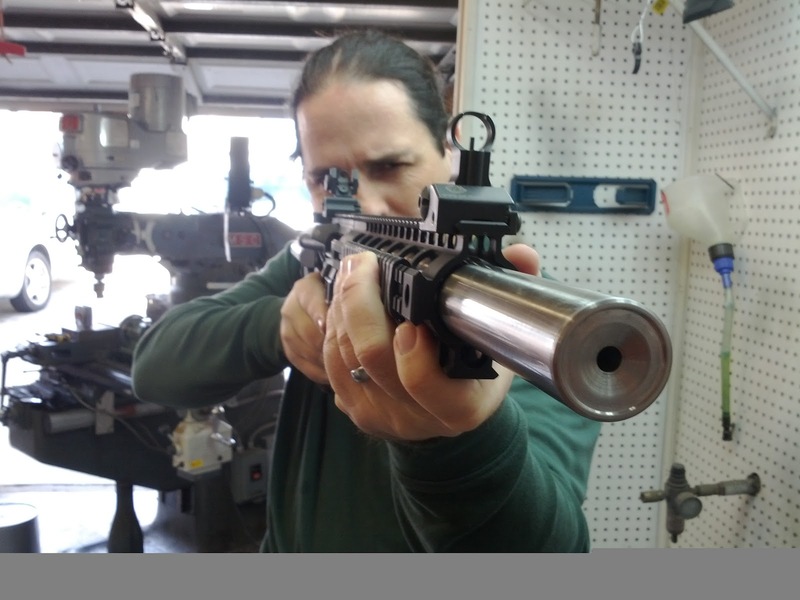 I stopped in to Templar Custom a few weeks ago and Bob, the resident Mad Scientist, made me watch this video about the DPMS GII rifle. Seems reasonable. I’ve held the AR-10 forgings. They’re huge. I can’t imagine an AR10 that didn’t feel like a boat anchor. But what’s the rifle like? DPMS brought their truck to the Gander Mountain grand opening. And they had some GII rifles. I picked them all up and I found them to be fairly light. The Recon was really nose heavy with all that rail out front, but the AP4 and the MOE were pretty nice. They all seemed to be about the same size and weight as a regular AR15. I asked and like the video said, anything from the magwell back is stock AR15. I can drop in a Giessle trigger and a Vltor Modstock. The barrel nut threads are the same outside diameter as the ordinary AR but the thread pitch is slightly different. I’d like to get one and see how it shot. Then I’d like to give it to Bob at Templar Custom and have him make me a barrel, mount it with his RaceRail handguard and generally try to make it as close to my AR as possible, just in .308. It would be a pretty cool experiment. I need money quickly so I could buy this. Sadly I don’t think I could get Erin Palette to run a fundraiser for me. She’d likely want this for herself. A North Carolina sheriff aims to cash in an ancient machine gun officers can’t use to afford modern crime-fighting riot gear it doesn’t own. The Rowan County Sheriff’s Office has owned a Prohibition-era Thompson submachine gun for decades. The “Tommy Gun” became infamous from its use by both law officers and criminals like Al Capone. It’s now popular among gun collectors. I wonder if the Wake County Sheriff would sign the paperwork? You’d think that the Rowan County Sheriff would call him up and put in a good word for me if I coughed up the cash for the gun. Hit the tip jar on the right side. If I get enough, I’ll bring it to the next blog shoot. How could I not want one of these? So, how do I get a double-barreled shotgun with no particular historical value that I can trash by cutting the barrels short? And can they shoot slugs? Watching the Cowboy Action shooters run a double barrel is a hoot. I wonder if you could take a short-barreled double to a tactical shotgun class. Doc Holliday used a double barrel coach gun at the OK Corral. It would probably still work. I can haz Vector with suppressor? I have a moneymaking plan that I think that Kriss would like to be part of. First, let’s look at a little photo. 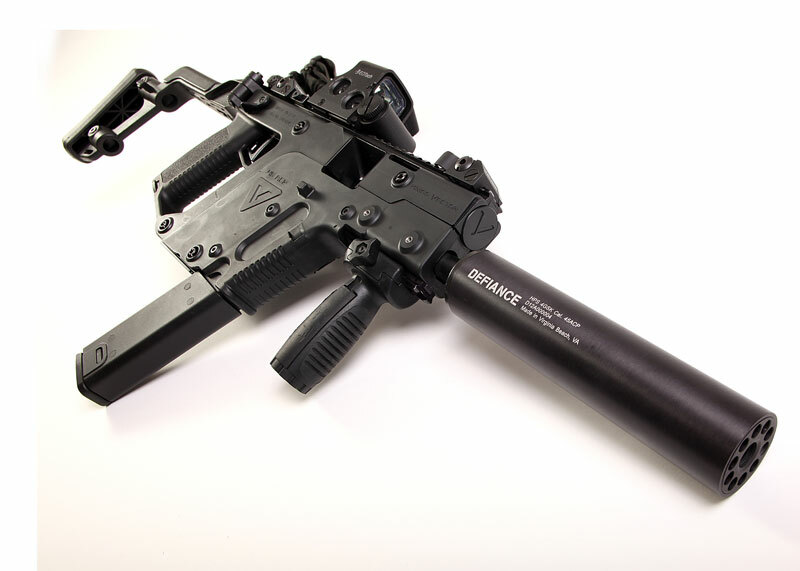 This is the Kriss Vector, in .45ACP. You will note that it is attached to the new Defiance suppressor designed specifically for the Vector. So here’s the deal. Kriss gives me the Vector SBR and the Defiance suppressor. Then I swing a deal with my local gun range. Every box of .45 ACP ammo sold to feed the Vector gets $1 sent to Kriss. It’s a win all the way around. I get the rifle and suppressor. The public gets to shoot it. The range sells more ammo. And Kriss gets a couple of dollars up front and lots of sales due to the exposure. So, what do you say, Kriss? I think I’ll jump on this meme before everyone else weighs in. Lust is a strong word. I don’t really lust after any guns. I’m a believer in the Andrew Tuohy seven guns theory, which is that you need seven different guns. Everything else is gravy. 4. 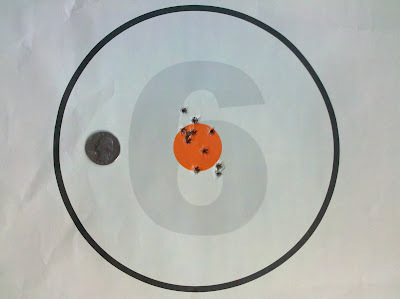 .22 LR rifle – My Ruger 10/22 Liberty Training Rifle is AWESOME!!! 7. 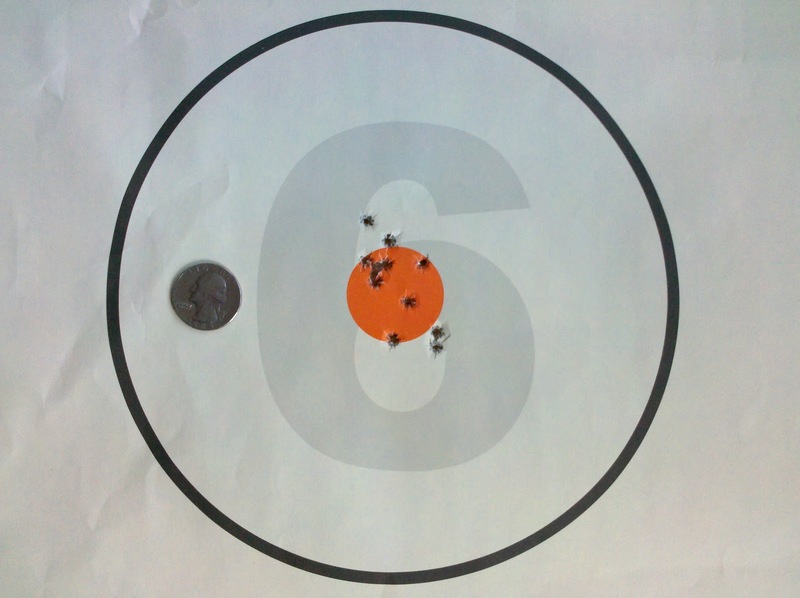 .22 LR pistol – If the 10/22 is awesome, my 22/45 with Volquartsen trigger is even better. 1. A .300 Blackout barrel for my Templar AR, or even better, the barrel and a second Templar AR with a 6.5 Grendel barrel and a scope. 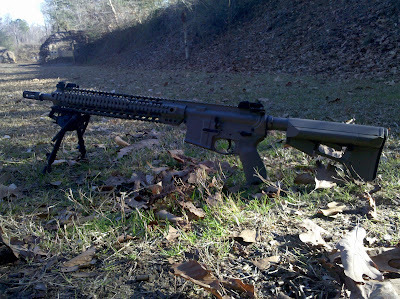 I also want a .50 Beowulf barrel, but I think that’s probably overkill for anything short of bear and moose. I would like to have a “Short range” AR with 16” 5.56, 16” 300 Blackout, and 16” .50 Beowulf, all topped with an EoTech, and a “long range” AR with an 18” 5.56 and an 18” 6.5 Grendel, all topped with a nice scope. 2. Mossberg 590 A1 with ghost ring sights and a 20” barrel. I like how the Mossberg has a tang mounted safety. 5. Kriss Vector. I mean, did you really have to ask? 2. An M1 Garand, the greatest battle implement ever devised. Plus they are fun to shoot. 3. A really pretty, high end custom bolt action rifle. Something with pretty wood furniture suitable for display. 4. An AK that I’ve built myself. 5. A Gatling Gun. I don’t know if I’d like the pretty brass one from the SHOT show, or if I’d like an 1876 type. I’d still like to get that Gatling Gun named as the State Gun of North Carolina. He was born here you know. All right all you technical guys. I need a new front sight for this gun. What I need is a taller front sight. 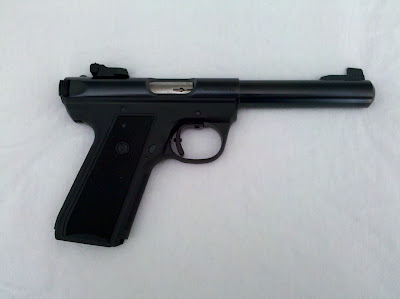 Does anyone know where to get a slightly taller front sight for a Ruger 22/45 Mark III (P512MKIII)? Yesterday I had a really nice conversation with a guy in Charlotte that sells silencers. He had been researching info on how HB650 affects us as gun owners in NC and ended up on my “HB650 What does it do?” page. Since he saw that I am interested in a Kriss SBR and a silencer to go with it, he emailed me and we ended up having a phone conversation that lasted about an hour. Unfortunately I will not be able to buy a Kriss from him right now, but it was nice to know that there was someone that specializes in silencers here in North Carolina. Give his web page a look and if you need more info, email him. And if you are going to the Charlotte gun show this weekend, look for him. 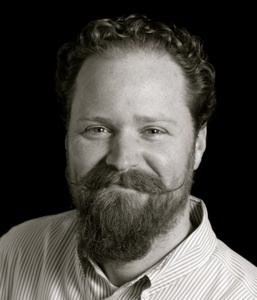 Tell him that Sean, from NC Gunblog says hi. You can also tell him that when I can scrape enough money together for a silencer, I’ll know who to call. 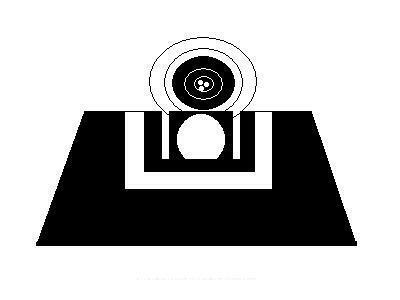 FTC Notice: I have not received anything from Eric of NC Silencers, nor has he promised me anything in the future. I just thought he was a nice guy when I talked to him and thought my readers would like to know about him. In the meantime, feel free to pucker up and kiss my backside. Nosy government agencies piss me off.